Graphene oxide is called a true wonder material. When added into nanocellulose foam, the lab-developed substance is light, flexible and strong, conducting heat and electricity efficiently and rapidly. Recently, a team of researchers from Washington University in St. Louis have discovered a method to use graphene oxide sheets to convert dirty water into drinking water. This could easily become a worldwide game-changer. “We hope that for countries where there is ample sunlight, such as India, you’ll be able to take some dirty water, evaporate it using our material, and collect fresh water,” said Srikanth Singamaneni, associate professor of mechanical engineering and materials science at the School of Engineering & Applied Science. 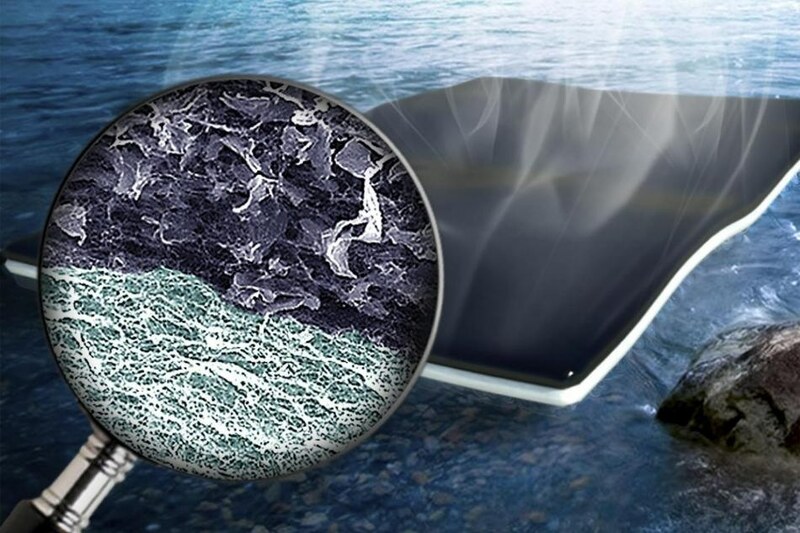 The new method integrates graphene oxide and bacteria-produced cellulose to create a bi-layered biofoam. A paper explaining the research can be found online in Advanced Materials. The process is extremely simple. The beauty is that the nanoscale cellulose fiber network produced by bacteria has excellent ability move the water from the bulk to the evaporative surface while minimizing the heat coming down, and the entire thing is produced in one shot. The design of the material is novel here. You have a bi-layered structure with light-absorbing graphene oxide filled nanocellulose at the top and pristine nanocellulose at the bottom. When you suspend this entire thing on water, the water is actually able to reach the top surface where evaporation happens. Light radiates on top of it, and it converts into heat because of the graphene oxide — but the heat dissipation to the bulk water underneath is minimized by the pristine nanocellulose layer. You don’t want to waste the heat; you want to confine the heat to the top layer where the evaporation is actually happening. The bottom of the bi-layered biofoam has the cellulose, which acts as a sponge, sucking water up to the graphene oxide where fast evaporation occurs. The resulting fresh water found at the top of the sheet can be effortlessly collected. The method used to form the bi-layered biofoam is also new. The graphene oxide flakes are embedded into the layers of nanocellulose fibers, which are formed by the bacteria. Using the same method used by an oyster to make a pearl, the bacteria create these layers. While we are culturing the bacteria for the cellulose, we added the graphene oxide flakes into the medium itself. The graphene oxide becomes embedded as the bacteria produce the cellulose. At a certain point along the process, we stop, remove the medium with the graphene oxide and reintroduce fresh medium. That produces the next layer of our foam. The interface is very strong; mechanically, it is quite robust. The new biofoam is also very light and cost-efficient to make, thus making it a feasible tool for desalination and water purification. “The properties of this foam material that we synthesized has characteristics that enhances solar energy harvesting. Thus, it is more effective in cleaning up water,” said Pratim Biswas, the Lucy and Stanley Lopata Professor and chair of the Department of Energy, Environmental and Chemical Engineering.